Many over-60s remember vividly the horrific day when John Fitzgerald Kennedy was shot, though probably a substantially smaller subset can recall the televised memorial service that took place two months later at Boston’s Holy Cross Cathedral in which Erich Leinsdorf and the Boston Symphony, together with a large chorus and distinguished soloists, presented Mozart’s Requiem in the context of a Solemn Pontifical Mass celebrated by Richard Cardinal Cushing. 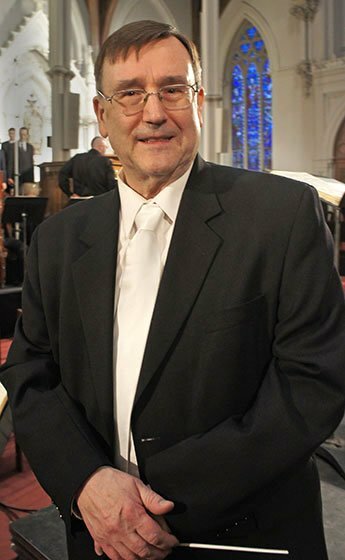 That historic moment [available on CD here] was recalled 50 years later to the day in a performance Sunday at Holy Cross by the Schiller Institute Chorus and freelance orchestra under John Sigerson. 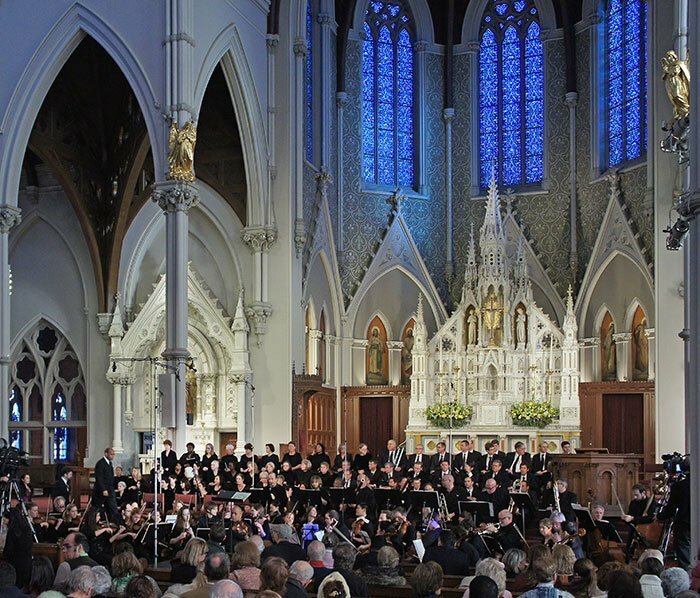 The performance Sunday was not presented within the context of a Mass. Rather, it was offered with introductory talks and interpolated speeches of JFK. Before Master of Ceremonies Mathew Ogden closed with excerpts from Cushing’s eulogy, “…the Geniuses of Art and Leadership were joined at this event,” we heard over 35 minutes of salutes and lofty sentiments from Ambassador Ray Flynn, Helga Zepp LaRouche, and, by letter, from City Councilor Steven Murphy and the president of the Irish Republic, Michael D. Higgins. No one can argue with the exhortations to eliminate poverty and disease, or to free the artist to follow his calling. Before the music began, we heard several minutes of JFK oratory. His voice spoke to us again before and after the Offertory, offering a surprising number of paeans to technology—space exploration and nuclear technology chiefly—but the importance of American exceptionalism was also a message in the familiar words. When the orchestra (mostly NEC students and Boston freelancers, with a smattering of Schiller Institute members) opened with the moving Introit, the well-executed walking bass and soaring clarinet reassured us that we would be hearing a polished traditional performance, no doctrinaire early-music approach. The playing was legato and sumptuous, filling the mammoth space with satisfying sonorities. The cleancut chorus entered with a fine wall of sound—suitably terrifying in the Dies irae. Throughout, their articulation coped with the reverberation: dynamics and accents were defined, and entrances were clean even in the fast fugal sections. The Tuba mirum opened with a Joshua-like solo from the unnamed trombonist, leading to baritone Ron Williams’s mellifluous waking of the dead. In the low-lying portions, he was not helped by the Schiller Institute’s campaign to lower modern pitch to 432 Hz in accord with Verdi’s dictum. But later in the vocal quartets, the work of the very lyric tenor William Ferguson and soaring soprano Nataly Wickham may have been eased by the quartertone drop, although the effect upon the moving mezzo Heather Gallagher seemed negligible. One would have to ask the choristers if they noticed any changes in their levels of comfort. The version of the requiem we heard was Franz Xaver Herr Doktor Seussmayr’s. Since, according to our advisor, Robert Levin, “We have nothing in Mozart’s handwriting for the Sanctus, Benedictus, Agnus Dei, and Lux aeterna,” we can thank Süssmayr for those pleasing sections. What Robert Levin has done to complete Mozart’s work is estimable and convincing, but it was probably appropriate to reenact only the version used in the 1964 performance. The unusual event provided the large and patient audience a satisfying and appropriate tribute to the 35th President. Afterward we asked Music Director John Sigerson about the sponsoring group [Wiki article here], which was new to us. BMInt: Is the Schiller Institute some kind of cult? Can we expect more events like this one? John Sigerson: Not at all. We are all inspired by that great American Lyndon LaRouche, and by his identity in helping the arts thrive. His wife, Helga Zepp LaRouche, founder of the Schiller Institute, is also a music scholar with an additional interest in Nicholas of Cusa [1401-1464] and the [1439-1445] Council of Florence. We have more events planned, but I shouldn’t tell you about them. The “very lyric tenor William Ferguson” was a sensation, let’s hear more of him in Boston. Not just one, but three trombonists (a trio with brio) pounded it out like I’ve never heard before; is it right for them to have been having so much apparent fun in a requiem mass? And then, the chorus. Amateurs all, hailing from the D.C. area, but they had performed the Requiem down there on Nov. 22 and traveled up here by bus for the reprise, all at their own expense. Deep background: The Schiller Institute and its guiding light Lyndon LaRouche (yes!) have historically and emphatically agitated both for a return to the A=432 pitch of yore as explained in the program notes, and for all individuals to engage in singing training and to join choruses as a fulfillment of higher human promise and classical art. They sang excellently, proving the point. Finally a word about the Cathedral of the Holy Cross. What a glorious place! I had never been inside before, and felt classical inspiration even before the music began. I had worried that the acoustics might be overly resonant, but from the sixth row everything sounded grand — with an RT60 of I would guess 3 seconds, (Symphony Hall’s being 1.9.) not so long as to confuse the musical lines but long enough to let you know you’re in an unusual place. Archdiocese willing, I’d love to hear a Bruckner symphony in there. Thank you, Mr. Johnsen, for your laudatory remarks about the chorus, and for sharing your correct understanding of the mission of the Schiller Institute. Not that it’s that important, but we (the chorus) did not all come from the D.C. area-my husband and I came from Philly, some came from New Jersey, and some from Boston. We only had two rehearsals all together before the concert! We are so excited and happy that so many people came to hear us and that they apparently enjoyed the performance, and we are greatly honored to have been able to sing in that magnificent cathedral on that historic occasion. Long live Mozart and JFK!